She's already been in stylish league with Rochas, Tibi, and Carrera y Carrera. Now that we're catching a glimpse of the "Olivia Palermo" bag from Jill Stuart, is it safe to say the Upper East Side style queen has designs over the entire industry? We're not ones to spread rumors, but maybe. Palermo also stars in a Blair Waldorf-inspired shoot, appropriately another northern zip code style maven, showing off the carry-all in orange, black, and blue. 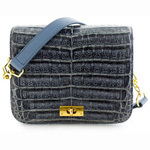 What do you think of the Jill Stuart bag? Let us know in the comments below.